After 7 years of the Smithfield King of the Smoker BBQ Invitational, the prestigious BBQ competition has come to an end. December 1st, 2018 was the 7th and final installment of the Smithfield King of the Smoker contest, and we’re proud to say it was one of the best. 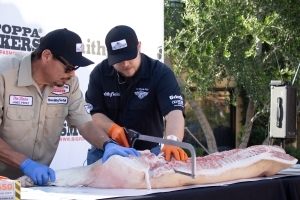 Twenty-four of the most elite teams in the world of BBQ were invited to showcase their expert skills at the Miramonte Resort and Spa in Indian Wells, CA. 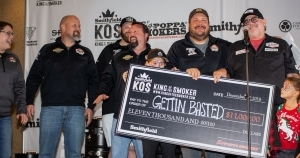 The teams battled head to head for the last chance at the title of the “King of the Smoker” and a chance at the $75,000 cash prize purse. After a long weekend of friendly rivalry, laughs, and lots of BBQ, the historic event came to an end with Brad Leighninger and his team Gettin’ Basted taking home the grand championship title and the $11,000 grand prize. Pitmaster Steve Hayden and his team One2bbq followed behind as reserve grand champions taking home $9,500 in prize money. Since 2012, 24 elite barbecue teams from across the nation (and overseas in 2018) have come together in the Palm Springs area in Southern California to compete in the most prominent BBQ contest in America. The competition has always been at no cost to the teams, outside of travel expenses. The teams were invited to stay at top level resorts in the Palm Springs area for the duration of the competition. Every part of the competition was covered from the meat to the ice – all the teams had to bring were their expert skills and their trusty smokers. The public has always been welcomed to enjoy music, barbecue samples, and pick up a few tips and tricks from the BBQ pros. The 2018 Smithfield King of the Smoker had live BBQ demos where delicious BBQ samples were enjoyed, BBQ catering and raffles. Top pit masters from the BBQ world shared their expert BBQ knowledge with fans, such as Tuffy Stone from Cool Smoke, Ernest Servantes from Burnt Bean Co. and Chris Lilly from Big Bob Gibson’s Bar-B-Que. The focus of the Smithfield King of the Smoker has always been about the ultimate challenge between the top 24 teams in the nation; but, we can’t forget about the theme of the event “doing good through barbecue.” Aside from the vigorous competition, the Smithfield King of the Smoker has been a fundraiser for the Casey Lee Ball (CLB) Foundation. The CLB Foundation is a non-profit where 100% of every dollar donated goes directly to helping sick children suffering from various kidney diseases. At the 2018 Smithfield King of the Smoker, nearly $200,000 was raised through sales and generous donations contributing to the $12 million that the CLB Foundation has raised throughout the years. All of the proceeds from ticket sales, food, raffles, and merchandise directly benefited the charity. All legal and administrative fees for the CLB Foundation are done pro bono; allowing every dollar donated to go directly towards pediatric kidney disease research. The Smithfield King of the Smoker may be coming to an end; however, fundraising to benefit children charities will not. Through the Big Poppa Smokers Cooking for Kids Program, sponsored barbecue teams select a local children’s charity to fundraise for in a points race. In 2018 alone, an additional $30,000 was donated to select children’s charities across the nation. A lot of work has gone into making the Smithfield King of the Smoker the elite barbecue competition many of you have come to enjoy throughout the years. Though we are sorry to see the event come to an end, we are glad to announce that the opportunity to test one’s skills in a prestigious barbecue competition is coming real soon. KOS Event creator and producer, Sterling Ball (aka Big Poppa) says “I am excited to announce that we are working with Smithfield and their amazing BBQ Council by creating The Smokin’ with Smithfield National Barbecue Championship in New Orleans.” In the spirit of the Smithfield King of the Smoker, the Smokin’ with Smithfield National Barbecue Championship will consist of the top 24 teams in the nation. These 24 teams will earn their spot in the competition through a year-long points chase. Smithfield has been a long-time contributor in competition barbecue, and we’re excited to see the Smithfield King of the Smoker turn into a bigger, national barbecue competition through the Smokin’ with Smithfield National Barbecue Championship. 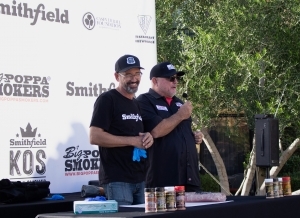 For more information about Smokin’ with Smithfield National Championship, visit www.SmokinWithSmithfield.com.